April Fools' Day 2018 project (didn't actually get it done until the 2nd, though). Screens can't really do this justice, so have a video. You've driven the desert route so many times you've lost count. Tucson to Vegas -- eight hours there, eight hours back -- at the wheel of that silent, empty bus, year after year after year. It's a pitiful, meaningless, hellish existence. But no more! Scraping together every last scrap of your savings, you've made a few little modifications to your bus. You've rebuilt it. Faster. Faster. And... uh, faster. Quite possibly a little too fast, if those flashing lights behind you are anything to go by. And you still couldn't figure out how to fix that damn right pull, or find some tires with enough traction to get you out of a ditch. Internally, Desert Bus actually does all its calculations in terms of meters. 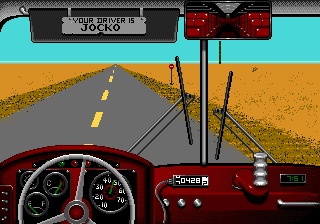 In the original game, the bus has a top speed of 0.375 meters per frame, which works out to 81.000 km/h or 50.33 mph (this despite the game's claim of a top speed of 45 mph; the conversion from metric is fudged to make this work). The game assumes a distance of exactly 648,000 meters from Tucson to Las Vegas, meaning a full-speed drive will take precisely 8 hours. So what does the hack do? First, it raises the bus's top speed to 0.499 meters/frame (108 km/h or 67.1 mph), which is the highest value possible without causing complications. That's a pretty paltry difference, though. The bulk of the speedup is achieved by running the most important logic calculations an extra 15 times per frame, which essentially causes the game to run 16 times faster on top of the base speed change. Thus, the new top speed of the bus is approximately (0.499 * 16) = 7.984 meters/frame, which comes out to 1,724.544 km/h or 1071.582 mph -- in other words, more than 21 times the original speed. 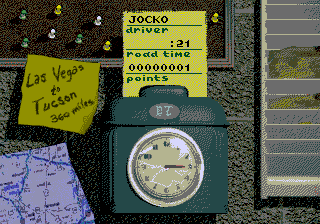 That means a one-way trip from Tucson to Las Vegas will take about 22 minutes (though due to rounding and the lag caused by the extra processing, the game reports the time as 21 minutes while it probably takes closer to 25 minutes in real time). The speedup also affects the handling of the bus, of course, making for much faster-paced gameplay. 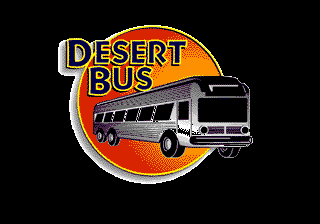 Unforunately, it turns out that even at 1071 miles an hour, Desert Bus is still Desert Bus. But hey, it sounds cool, right? No?